Central Oregon athletes, we've found the book for you, "Run Fast. Cook Fast. Eat Slow: Quick-Fix Recipes for Hangry Athletes." The cookbook will hit the shelves Aug. 14, but you can get your copy and join a one to three mile fun run and book signing with FootZone Bend. 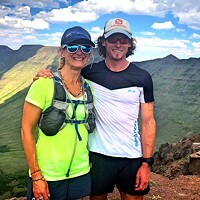 It's an opportunity to run with and meet the authors, Shalane Flanagan—four-time Olympian and winner of the 2017 TCS New York City marathon—and Elyse Kopecky, a local chef. After the run, a discussion and questions and answer session with Flanagan and Kopecky will take place at Thump Coffee in The 1001 Tech Center. The event is free and you can pre-order your book for $25 but you need to pre-register online.